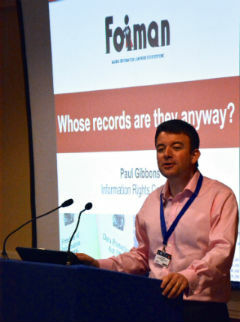 FOI Man summarises the changes to the FOI Act that result from the passing of the Protection of Freedoms Act last week. And finds that not much has changed over the course of the last year. The Protection of Freedoms Act came into force on 1 May 2012. Amongst its many implications are those for the Freedom of Information Act (though we still await a commencement order in respect of these provisions, so it is not yet clear when they will come into force). I previously wrote about this when the Bill was first published early last year, but now that it has entered the statute books, it is time to see what the approved legislation requires. where a public authority is asked for information that is in the form of a dataset (defined in the new section 11(5) – or s.102(2)(c) of PoFA), and the requester asks for it in electronic form, as far as is reasonably practicable (explained at s.11(2) of the existing FOI Act), the public authority must disclose the dataset in a re-usable format. removes the obligation to allow re-use until such a fee has been paid. these regulations would apply to datasets disclosed in response to FOI requests and listed in a public authority’s publication scheme. 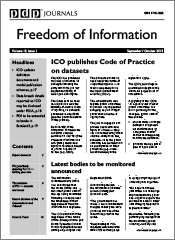 Talking of publication schemes, public authorities will be obliged to publish datasets disclosed in response to FOI requests in their publication schemes unless they are satisfied that it is not appropriate. They will also have to publish updated versions when they change. Section 19 of FOI has been amended to this effect (it now includes a section 19(2A-F)). Section 45 has been updated to require the Secretary of State to make provision in the Code of Practice for disclosure of datasets. Section 103 of the Protection of Freedoms Act closes down the loophole in the coverage of FOI for bodies established by two or more public authorities by amending section 6 of FOI. Section 104 extends certain provisions of FOI that hitherto had not applied to Northern Ireland to that jurisdiction. Section 105 amends both the Data Protection Act and FOI to extend the Information Commissioner’s term of office from 5 to 7 years, and limit those appointed to the post to one term. 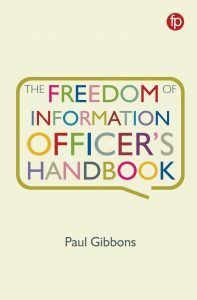 Section 107 amends section 47(4) of FOI allowing the Information Commissioner to charge for “relevant services” – training, multiple copies of published material, and conferences – without consulting the Secretary of State (as he was obliged to do previously). expect the Information Commissioner’s Office to start charging for training and conferences. Not much has changed on this aspect of the Act since the first draft over a year ago. We now need to watch out for the commencement order bringing these changes into force, the revised section 45 Code of Practice, and any regulations on charging for re-use.